This elegant victorian stainless steel style strainer will sure please you. It is Pretty & practical. It was designed for those brewing thier favorite tea in a mug rather than in a petite traditional tea cup. The deep cone design fits perfectly in your favorite mug. 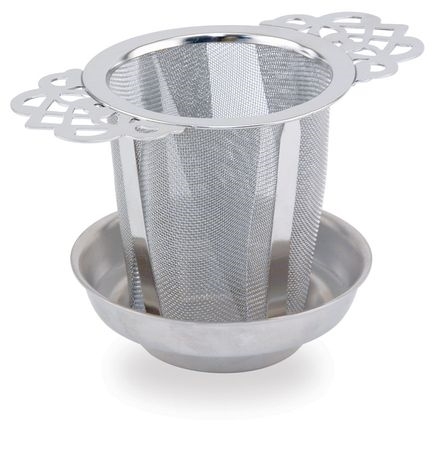 The deep cone basket gives plenty of room for the tea and herbs to expand freely while steeping, thus, allowing the precioius oils and flavors to be released easily. When brewing is complete place the cone basket on the drip tray included to make brewing mess free. Perfect and beautiful. Easy to clean with a rinse and easy to use. This is our favorite tea infuser.